A lot of people have asked us how we brought our new puppy back to Equatorial Guinea from the USA. I thought I’d share on the blog, since my primary source of information when I was researching how to do so was other random blogs, and this way there will be one about bringing a dog to Malabo! This is a really long post, and unless you have an interest in flying with a dog, may be quite boring. I’ll write the next post for broader audience appeal, I promise. Cormac and I knew after Murphy passed away that we would be getting a new pet before we left Malabo. When you live and work together all day, every day, you need a third body in the house to play Switzerland. We briefly considered getting a cat, but cats are a rare find in Malabo, as many families supplement their diet with feline meat. Plus, I’m really much more of a dog person. So we decided around Thanksgiving that we should start looking for a new dog. We thought about getting another rescue from the streets, but had one primary concern. We already own a dog crate for transporting the dog from Equatorial Guinea to the USA, and it’s for a dog weighing 30-50 pounds. Street dogs come in a variety of shapes and sizes, but most of them are in the 50-60 pound range. We’d either have to wait until a few months before our tour ended, so the dog was still a puppy when we tried to fly home with it, or pray that it was as malnourished as poor Murphy was when we got him so he’d be underweight when full grown (which isn’t the kind of prayer you want to be sending out). Using our crate size as the first search parameter, we started looking at our options. We wanted a dog that was big enough to go hiking with us, but no larger than 50 pounds. I kept reading that Australian shepherds are rugged, easy to train, and good with people. I then found out that there are miniature Australian shepherds that get to be 30-40 pounds, and we decided to start looking for a breeder near our home towns. I found a family breeder that was just 20 minutes away from Cormac’s parents house, and reserved a puppy sight unseen. 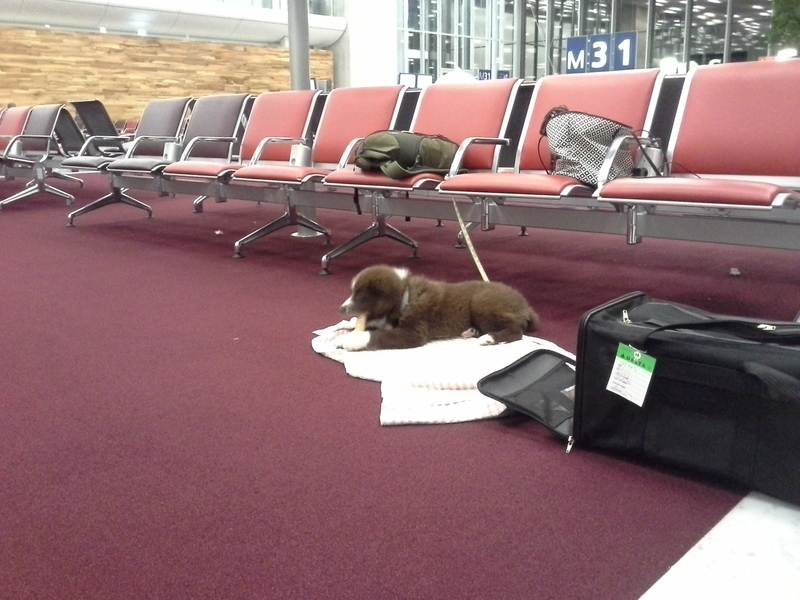 Next, I called the airline we were traveling with and booked a spot for the puppy under my seat for the return flight. Already hiking at 10 weeks! When we showed up at the breeder’s house, we were over the moon for our little Molly. She looked, and still does look, just like a little brown bear. It was love at first sight. 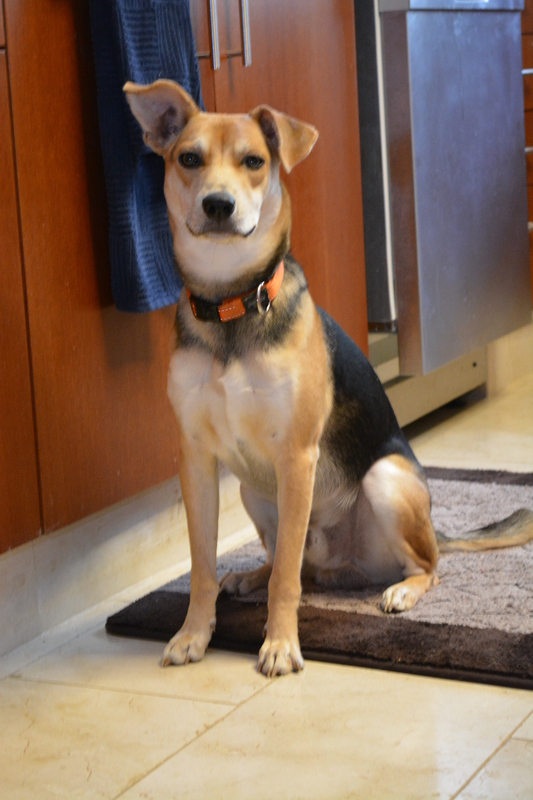 She has such a sweet temperament, is eager to please, and has been so easy to train. In order to export a dog from the USA, you have to find a vet that is USDA-APHIS certified and get a health inspection. Molly passed her health exam, but was one day too young for her rabies shot on the day of the appointment. The next day we took her back to get her rabies shot, then headed to the USDA office to get our paperwork certified (this can also be done by mail, but we’re lucky that my mom lives within 30 minutes of an office). The paperwork is the hardest part of traveling with pets. We could not find any reliable sources of information on the import requirements for Equatorial Guinea, so we went with the assumption that they matched the neighboring countries, and decided to just get the USDA certificate, rabies vaccine, and a microchip (which you must have if you’re going to transit through the EU). The woman at the USDA wanted us to get the full EU paperwork before she would agree to stamp our USDA papers, which is much more time consuming and complicated. In the end, she agreed to certify the USDA certificate and had us sign a “fly at your own risk” letter which covered her in case we got stopped by an airline or airport customs official and turned back because we didn’t have the EU documents. Together, the vet visit and USDA stamp set us back about $200. We were a bit worried about what would happen if we had to change terminals in Paris, and therefore go through customs. We couldn’t get a firm yes or no about whether or not passengers with connections were exempt from the full EU import requirements, as you had no intention of actually importing the animal. This didn’t end up mattering for us, because our connecting flight left out of the same terminal we arrived in. Even though Air France’s website states that dogs less than 17 pounds can ride in the cabin, the representative I spoke with on the phone to make Molly’s reservation told me that the maximum weight of the dog and carrier is 13.2 pounds on international flights. This was a source of stress for me during our whole R&R, because Molly weighed in at 13 pounds on the day we picked her up, and she still had two weeks to grow before she boarded the plane! I scoured the internet for stories about people checking in with overweight dogs in the cabin. There are not a whole lot of people who take their dogs on international flights and then blog about the check in procedure, oddly enough. I decided that maybe the lady on the phone was wrong, and that the website figure of 17 pounds was really correct. Since no one ever weighed Molly on the day we flew, I still don’t know the answer to that question. 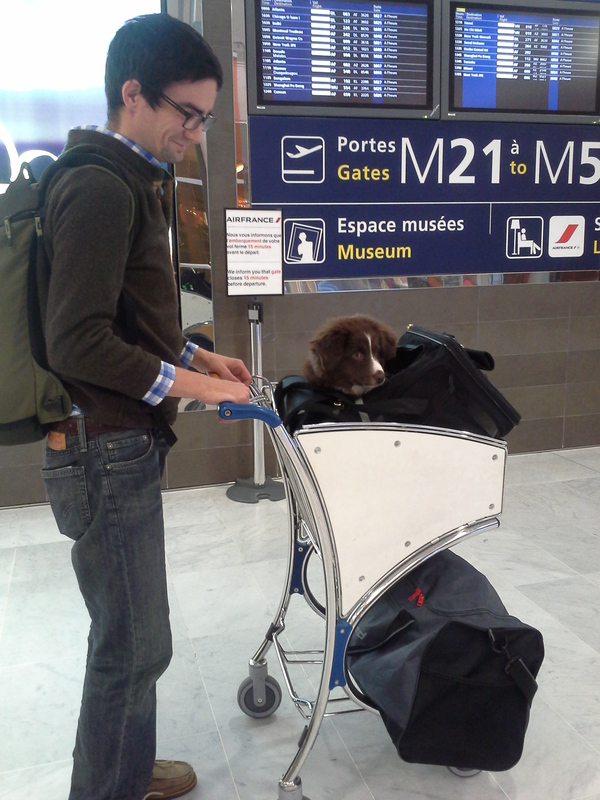 Air France also requires that the dog be at least 10 weeks old, which we had no issue with. The morning of our flight, Molly tipped the scales at just over 15 pounds. With every appendage on my body crossed, we approached the check-in counter. Because we were flying out on the Saturday before Christmas, the airport was pretty crowded. The woman who checked us in glanced at the dog, acknowledging its existence, charged us the $200 pet fee, then gave us a tag for the carrier and sent us on our merry way. I had been mentally preparing to have our documents and pet carrier scrutinized for nothing! I took Molly out of her kennel and carried her through the metal detector, and beamed with pride as TSA and fellow passengers cooed over our little fluff ball. We waited until 30 minutes before take off to go through security so that Molly could spend as much time as possible outside of the carrier. She didn’t make a peep for the first flight of one and one-half hours. We were off to a good start! Our first connection was through JFK. We had to exit the terminal we arrived in, go out of security, walk outside a ways, and then go back through security. Because of some winter weather fun, we ended up getting re-booked and had to check in at the Air France counter to pick up our boarding passes. When I got to the counter, the Air France agent informed me that our tickets had been canceled. She quickly reissued the tickets and waived us on without glancing at the dog, which I made sure to tell her we had with us several times. We again waited until the last possible minute to go through security, and Molly was cooed all the way through. When we got to our gate, we were pleased to see another young couple boarding with a pug puppy. They told us that it was their first international flight with the dog, so they were a bit nervous, too. For some reason this was very comforting to me. As the plane began boarding, we gave Molly a Benadryl, as recommended by our vet, to help her sleep. She whined when the plane took off, then didn’t make another peep until Paris. She was so quiet that I actually stuck my hand in the carrier several times to make sure she was still breathing! In Paris, we had to go through a security screening but not through customs. We landed really early, around 5:30AM. We found a quiet hallway with tile floors, laid out some puppy pee pads, and let Molly out of her carrier on her leash. We stayed hidden away to let her drink plenty of water and then waited for her to pee again. After that, we were in serious need of some coffee, so we put her back in her carrier and went looking for a cafe. I had read online that Charles de Gualle airport is pretty pet friendly, and we observed many people walking their dogs through the terminals on our way from Malabo to the USA. Once we had cleared the duty free shops and restaurants, we let Molly walk on her leash through the terminal. We steered clear of people to avoid scaring or annoying anyone. This lasted all of two seconds before she tried to jump ship! We had a pretty long layover, about 5 hours, so our gate was empty when we first arrived. We let Molly eat, drink, and play out of her carrier (still on leash) until the flight began boarding. Thankfully, Molly sends clear signals when she needs to go to the bathroom, so we were able to catch everything on puppy pads. She is a little pee-shy, so we would walk her to the restroom and lay out some puppy pads on the floor so she could go in peace. We gave her one more Benadryl before boarding our flight from Paris to Malabo. Our last flight was six hours from Paris to Douala, an hour on the ground in Douala, then a thirty minute flight to Malabo. The plane got a little warm during the stop over in Douala, so Molly began to get uncomfortable and whined a little bit. I was worried she would start freaking out and barking after traveling for nearly 30 hours, but she was easily appeased with some treats. When we arrived in Malabo, we found out our checked bags didn’t make the flight. We had to wait for all of the luggage to unload before we could file our missing bag claims. Even through the waiting in a hot and loud baggage claim, Molly remained quiet. When she finally hit the ground of the Embassy and got to run off leash, it was pure joy for all of us weary travelers. In summary, I worried for two weeks about how much Molly weighed, how much her carrier weighed, and whether or not our paperwork was correct. No one ever checked the weight, or even asked to see our papers. As a policy person, I hope this was a fluke and the system was just broken that day. Thanks for sharing! Planning on bringing doggie back in June and some helpful info.